From 1982 until 1997, the Stopford family had a VH Commodore. It didn’t look quite like this one, mind you. Our Commodore was canary yellow with a brown vinyl interior and matching rust on the rocker panels. It was also the first car I was ever driven in. 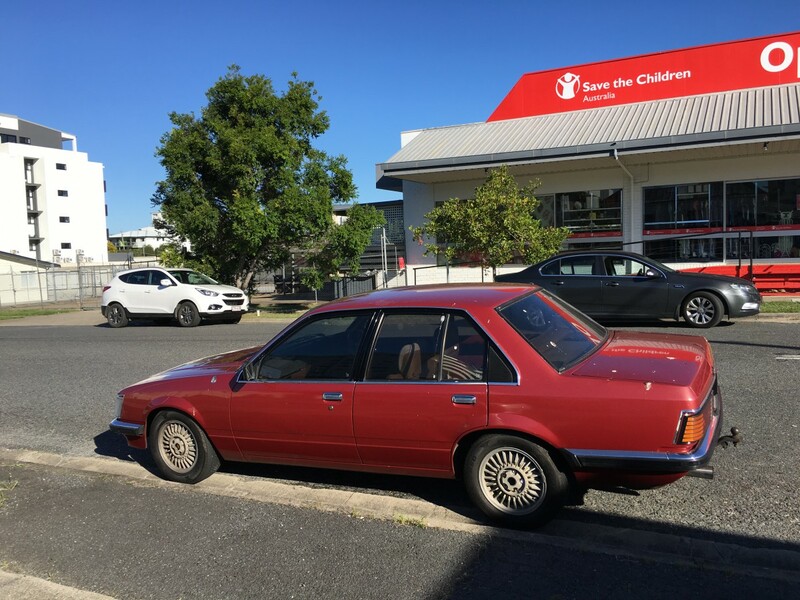 On this special day – my mother’s birthday – let’s take a look at the VH Commodore and the part it played in my childhood. My father had a long line of company work trucks so my time in the Commodore was spent mostly with mum behind the wheel. She helped fuel my burgeoning love of cars, something that had first came to life when I was around 2 or 3. I would point at cars and say, “brown car” and “red car”. By the time I was 4 and in pre-school, that had advanced to being able to recognize cars by name. Mum bought me my first issue of Which Car? in March 1995 and I was instantly hooked. After that issue, she would take me down to the newsagent every time a new issue came out up until the magazine went out of print in 2000. Mum nurtured my love of cars by taking me to the Brisbane Motor Show each year. We wouldn’t drive into South Brisbane, though – Mum didn’t (and still doesn’t) like to drive when there were good public transport connections available and the Brisbane Convention and Exhibition Centre was certainly well connected by bus and train. Taking public transport did make it tricky, however, when I had bags and bags of brochures I’d collected from the motor show stands. There would have been plenty of room in the Commodore for my stacks of brochures as these cars were well-sized. With a width of 67.8 inches and a wheelbase of 105 inches, there was plenty of room for four people although the drivetrain hump made the fifth, center-seat occupant a tad uncomfortable. There was plenty of space for young me, though, and my brown, foam car seat. I just wish we had taken some photos of the car – I couldn’t find any in the family albums. Mum recently found some of my old brochures from a Motor Show many years ago – Brisbane stopped hosting them almost a decade ago – and she was quick to recount how I used to tell her when a car salesman or booth employee made a mistake. I also used to write letters to magazines to request they conduct a comparison test between a particular set of vehicles – hey, I loved comparison tests back then, too – and my mother would then post the letters for me. 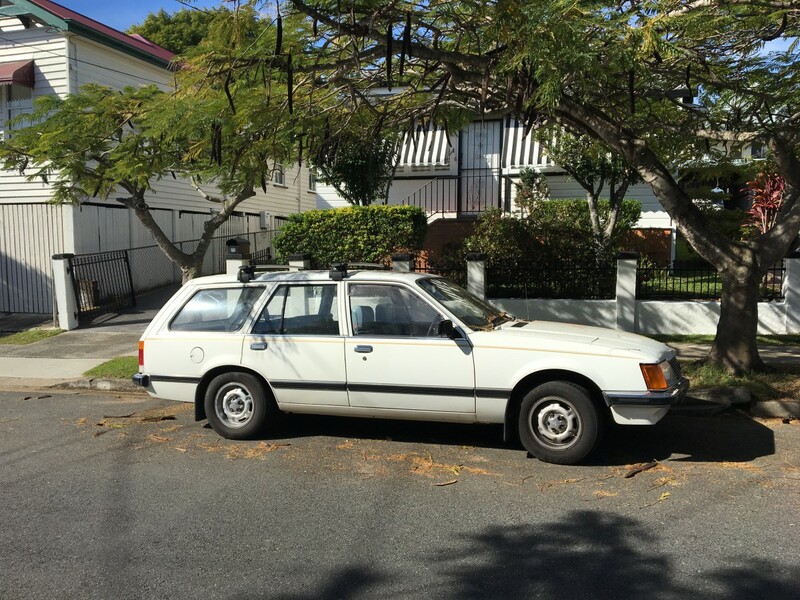 Mum would also drive me in the Commodore to car dealerships to look at cars and I would regale the salespeople with my knowledge of the products they were selling. In hindsight, it all sounds rather embarrassing but I’m told it was endearing. It was probably cuter when I was a precocious seven-year old rather than a tubby twelve-year old, mind you. 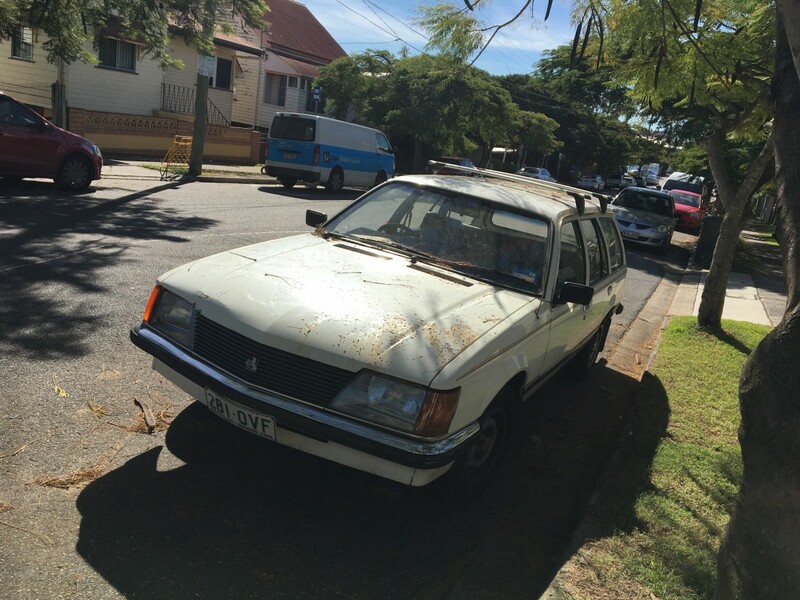 By the time I was well and truly in the throes of automotive obsession, with my visits to dealerships and newsagents and motor shows, the family Commodore was looking worse for wear. As my Mum said the other day, “It was good until it was falling apart.” Rust aside, though, it had held up well after 15 years of use. The same couldn’t be said for the mud brown VC Commodore it had replaced. That Commodore, an automatic, continually stalled. The dealer’s advice was an unhelpful, “Just keep driving it, it’ll sort itself out.” Nevertheless, my parents still went and bought another Commodore. At least the VH redeemed the Holden brand for them. 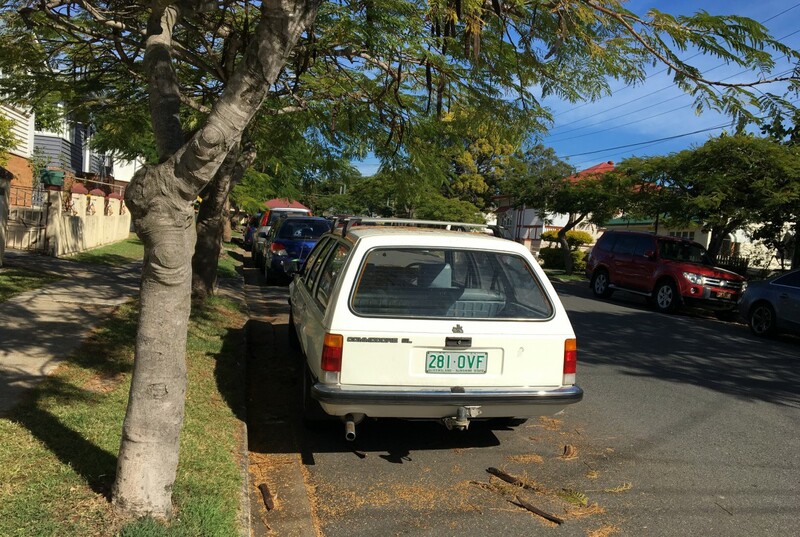 The only hitch was its poor theft protection – one night, it was stolen while Dad had parked it in the city although it turned up later, a few suburbs away, with no damage. Commodores and Falcons were always on the Top 10 list for most stolen vehicles, owing to their often poor theft protection and their ubiquity. The VH was a modest facelift of the VC but I maintain to this day the minor headlight, taillight, fender, and grille tweaks made the car look bigger and more substantial, somehow. The louvered taillights were also reminiscent of a contemporary Mercedes-Benz. The range still opened with the gutless Starfire 1.9 four-cylinder, effectively a Holden six that had been cut down and produced a measly 72 at 4400 rpm and 101 ft-lbs at 2400 rpm. The “Misfire”, as it was colloquially known, struggled mightily to haul around the Commodore’s 2539-pound curb weight: it reached 60 mph in around 17 seconds. And that was with the manual! Fortunately, my parents avoided the base four and even skipped past the 2.85 six-cylinder (97 hp at 4400 rpm and 137 ft-lbs at 2800 rpm), choosing the carbureted 3.3 six. This engine produced a more substantial 111 hp at 4000 rpm and 170 ft-lbs at 2400 rpm, although it still took around 13-14 seconds to hit 60mph. Our VH had a four-speed manual transmission, while the 1.9 and 2.85 were available with a five-speed stick. The 2.85 and 3.3 “Blue” motors were evolutions of the “Red” Holden six of 1963 so neither were the last word in modernity, efficiency, power or refinement. 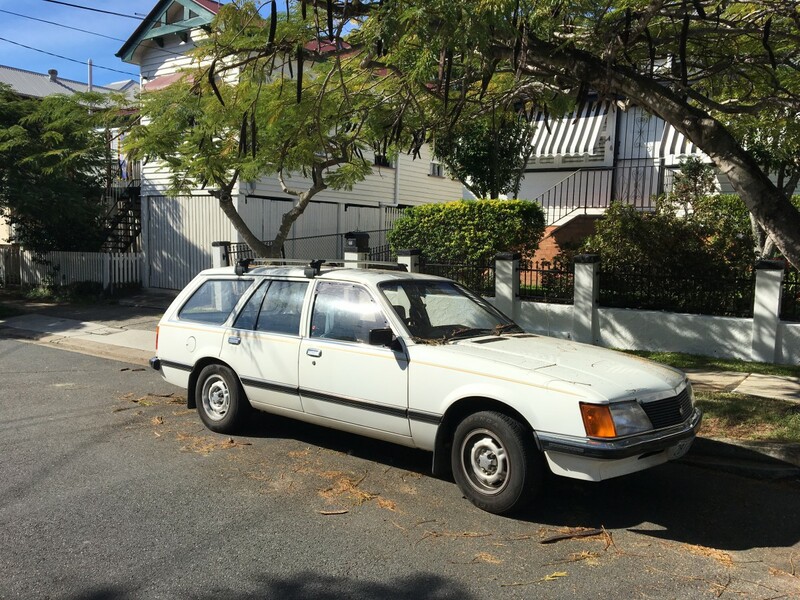 The Commodore was shaded by the Falcon in outright power but it made up for it with superior handling thanks to its Opel Rekord origins. My family never would have touched the optional V8 engines. Holden offered two in the VH, both with a choice of single or dual exhaust—in comparison, Ford offered no V8 Falcons between 1982 and 1991. The VH’s 4.2 V8 produced between 134 and 159 hp and 198-213 ft-lbs, while the 5.0 produced between 156-168 hp and 247-266 ft-lbs. To my parents, a V8 engine was pure frivolity and utterly unnecessary, especially considering our VH was in lowly SL spec with steel wheels; the SL had a rear demister, an AM radio, and precious little else on its features list. Atop the SL sat the SL/X and posh SL/E models, the latter of which was available in glamorous “Shadowtone” two-tone paint. Mum found the Commodore easy to drive, certainly more so than the bigger Holden Kingswood wagon they had owned in the 1970s. The Commodore was trimmer while still offering a spacious cabin, although it was narrower than the rival Ford Falcon. For our family, the Commodore was large enough. For taxi and fleet buyers, the Falcon was preferred and that was part of the reason the Falcon came to overtake the Commodore in the sales race during the 1980s. Other than some improvements to the engine management on some of the VH’s engines and some cosmetic tweaks, the VH was little changed from the VC. 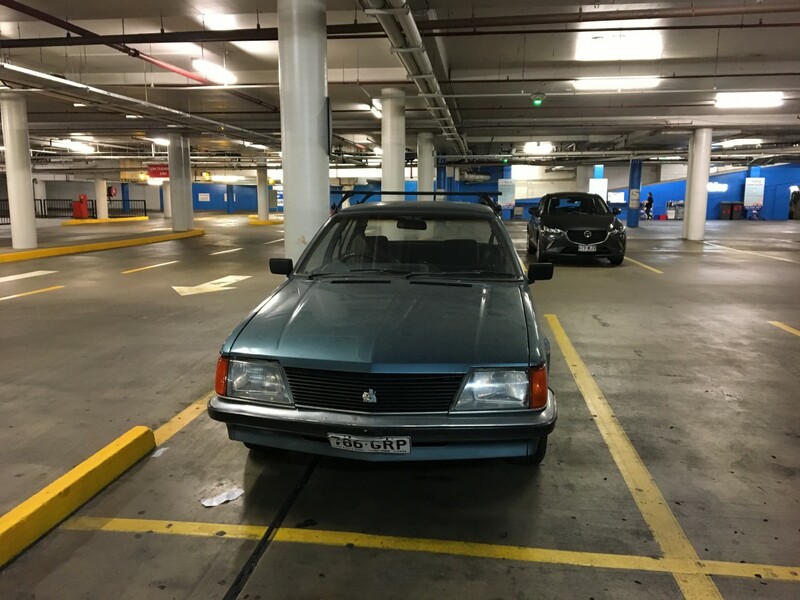 Holden further massaged the basic ’78 VB design with the VK and VL Commodores and even continued to use some of its underpinnings with the redesigned ‘88 VN. By the time my parents were looking to replace our VH, Holden was all the way up to the new-for-1997 VT. I was quick to offer plenty of car-buying advice to my parents – some of it, in hindsight, rather crap – but I recall only going along on one test drive. That was in a base model Toyota Corolla which I distinctly remember Mum disliking as she found it too bland inside. My parents once again ended up at a Holden dealership, where they bought a dealer demonstrator Holden (nèe Opel) Astra GL. It was dramatically different from the Commodore, being smaller, front-wheel-drive and more expensive-looking, inside and out, than the decidedly fleet-spec Commodore. It was a bit snug for the three of us Stopford siblings in the back but we managed. Increasingly comfortable and spacious small cars basically annihilated the mid-size segment and probably did serious damage to the Falcon and Commodore, too. The Commodore was still running fine when we sold it but Mum was fairly happy to see it go. The Astra was her baby and she affectionately dubbed it her “little red car”. While she never fawned over the Commodore, it earned the respect of our family. When I see a VH on the road, I remember the part it played in my childhood. It and the following Astra no doubt helped form my appreciation for General Motors. When I see a VH on the road, too, I remember the special lady that helped foster my love of cars. And that was a great story, thanks Will. Those are good looking cars, just like the Euro Opel Rekord and Ascona of the time that my relatives had. However you never answered the question of who fostered the love in you of artificially lit subterranean concrete spaces? Sadly, Jim, Pete is right. I now try to keep my head down in parking structures because I don’t want to find another great sighting that will photograph so poorly. I had to use these SL/X photos because VHs are so rare but as a rule, I try to avoid parking lot photos nowadays for both here and for my parkedinbnenyc Instagram. These are good looking cars, but even so, they probably would have been sales duds after a generation or two if they had been sold here in America. It is hard to believe a “family” car was offered with a 4 speed manual transmission. In the US a 4 speed was almost exclusively reserved for sporty 2 doors. And with few exceptions, when a manual transmission was offered, it was a 3 speed. I guess I was not as knowledgeable about cars at a young age as you were. I could spot the differences between various makes at 10 or 11 but didn’t have any ideas about the mechanics of cars and car engines. I just knew a Ford 289 cubic inch V8 was a good engine because my father’s cars were powered by them. While my mom always had a 6 cylinder powered Plymouth. But how much power each produced? I didn’t have a clue. It sounds like your mom is a neat lady, I hope she has many more happy birthdays. I don’t know about that, in the mid 80’s and well into the 90’s over here you could get all manner of “family” cars with manual transmissions but mostly they were 5speeds and probably imports, not domestics. Maxima, Camry, Passat, 626, certainly the Accord, even the early Taurus had a manual option (or standard) IIRC. I’m not aware of many cars of the period that had a 3speed manual,certainly not imports. And of the domestics, were those mainly of the “three on the tree” variety? But that was also much longer ago, right? 3-speed column shift manual was gone from nearly all US sedans by the late ’70s, but apparently the base Aspen/Volare had a 3-on-the-tree if you ordered the Slant-6 and 3-on-the-floor if you ordered the 318. 3OTT stuck around in most full-size pickups and vans into the ’80s. The B-Series/Voyager vans dropped the option in 1980, along with the D100/200 pickups and Ramcharger/Trailduster. It had already been limited to B100 and 200 vans after ’77. As far as I can tell, all one-ton pickups regardless of manufacturer never had a 3-speed manual. Unlike Dodge, Ford kept the 3OTT available in all vans, even the E-350s, through 1981, but in the 1982 they limited it to E-100s and 150s. Presumably, it was discontinued fully along with the last seventh-gen F-150/250 light-duty in 1986. The full-size Bronco never had 3OTT. GM ended up being the final holdout with the 3 on the tree: it was available on all vans through at least ’81, but by ’83 was limited to the G10 and G20. The same was true of the Blazer/Jimmy: still there in ’81, gone in ’83. Half-ton Suburbans only had 3OTT until 1980 for 4WD models and 1981 for 2WDs. 3OTT was available on C/K10 and 20 pickups through 1981, and then only on the C10 through the end of the 1987 C/K line. GM was also the only company that offered the 3-speed on its heavy 3/4 ton pickups. The Taurus MT-5 sedan or wagon was the only non-SHO Taurus to have a stick, and only came with the miserable 2.5 engine (a stroked Tempo 2.3). I guess I should have been a bit more specific and said domestic badged “family” cars. As far as your mentioning the imported sedans available with a 5 speed transmission, I would hazard a guess (based on how many I have seen for sale over years) that while imported car makers OFFERED a 5 speed manual, few customers opted for it. The point is, this is in Australia,where the engines were smaller, so like in Europe, four speed manuals were the default norm until 5 speeds took over. Growing up in the UK in the 60’s, I can’t think of a single family car that WASN’T a 4 spd manual, other than a few autos. Not just British cars, ALL european makes. The Vauxhall Carlton, as it was marketed here, was the archetypal fleet car that fared less well against the Ford Granada than their Cavalier did with Ford’s Cortina. I have fond memories of a Carlton 3000 GSi that I wangled as a company car in 1990. With a 24V 3ltr straight 6 and 204hp, it was about 60% the cost of a BMW 528i, but closer to 95% as good – and the basis for the legendary Lotus Carlton. The Austin Maxi was 5 speed, through necessity of the inadequate engine, from 1968, and was unusual for that for a mainstream brand right through the 1970s. 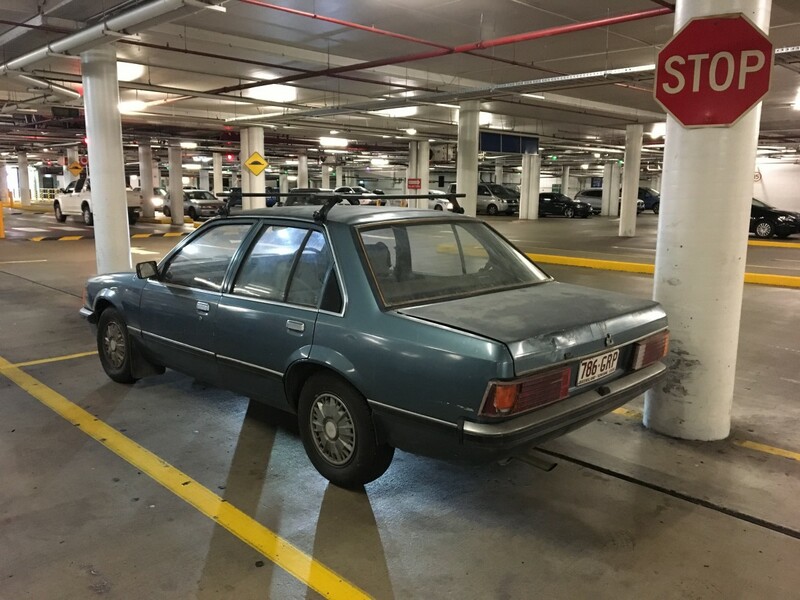 By the time this Commodore was built, the Australian market had come to expect a 4 speed, whether the engine’s torque characteristics needed them or not. A 3 speed was what your dad’s car had, it was decidedly old hat. 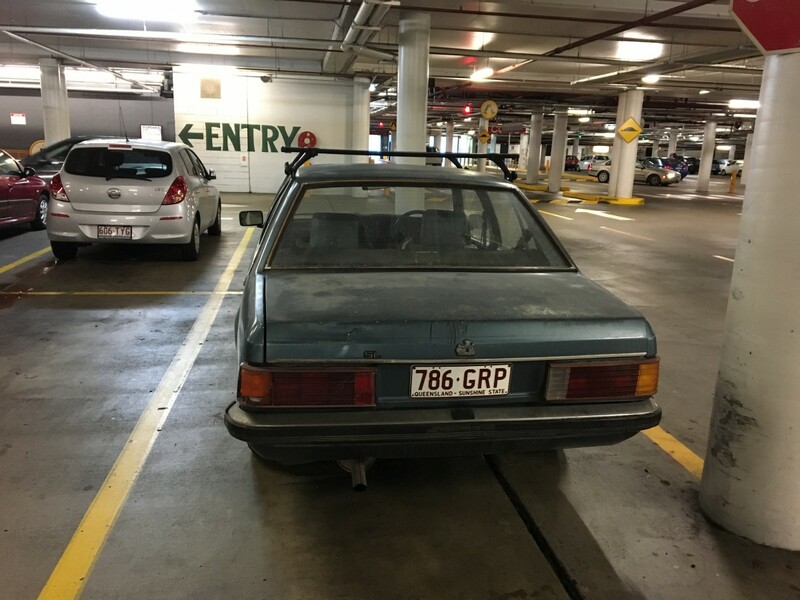 And nobody wanted a column shift – young guys had spent the past 15-20 years ripping them out of their old Holdens and replacing them with a floor shift. Now those guys were in the position to buy a new car – guess what they expected? What William doesn’t say here is that that 4-speed was bloody awful! Fairly unpleasant, feel-free change, a very springy over-centre clutch and moan-prone, but dumbest of all, first and second gears felt identical. Easier and simpler driven as a three-speed. The so-called “Aussie” 4-speed box fitted to V8’s was far better, though noisy. If your mum drove that Commode smoothly, William, respect! My family had a VC, 2.8L with the 4 speed manual in my teenage years, which I learned to drive on. I remember it being tricky to shift smoothly but I thought that was just my L-plate lack of skills. I quite liked its European-style design, ride and handling — worlds apart from its predecessor, a wheezing 1970 Valiant with wallowing leaf spring suspension, saggy bench seats, and drum brakes all around. +1. I still have mine from the sixties and seventies, somewhere. Yup! Still have a lot of them. Can’t bear to throw them out, too lazy to catalogue and sell them! William, you touched a soft spot in me. My late Dad got a ’79 Rekord E, a 2.0, in 1981, less than 2 years old, and with 18.000 km on the clock. I was 15 at the time, and it was one of the cars I learnt to drive in. My dad passed away about 3 months later, so that car left a huge emotional meaning on me. We kept it for about 5 years. It was a reliable car for the time, even though I was too short on money to keep it well maintained. Here in Uruguay Rekord were not your typical family car, costing about 17K (American) at the time. A 4 door Brazilian Chevrolet Chevette would cost about 10K, and a BMW 320 about 20K. No options in Uruguay, you took them as they came. The ’79 Rekord had vinyl top, chrome rims, tinted glass all around, rear glass demister, a tachometer, an AMFM stereo cassette radio (locally made), and power steering. Only 4 speed manual was offered, but some got converted at the assembly line to a 3-sp automatic which supposedly was a leftover from the Opel Commodore A (I don’t know if that’s true). I don’t know ig a gearbox that fit a 2.5 will work adequately with the 4-cyl, but power was similar. Oh, well. Congrats to your Mom, William, and thanks for reminding me of the nicest car I ever had. De nada! Sorry to hear about your father’s passing at such a young age. Your Rekord sounds like it was quite a nice car! An excellent birthday tribute to your Mother, Will. Isn’t it funny how a car will become so associated with a parent. My own mother spent many more years (20) in a pair of Crown Victorias than she ever did in her three Oldsmobiles (13) , but I still think of her as an Oldsmobile gal at heart because that was what she drove when I was young. What pests we all must have been to our parents, right? Oh the advice I tried to dole out as an all-knowing 12 year old. Hell, her time with the Buick is approaching the 3 Oldsmobiles! Sincerely hope your mother gets better. I also think of 2000’s as an eternity while the 2010’s went by flying, being a late 90’s kid! I had a 83 VH Commodore SLX 3.3 auto with Monroe gas struts up front and gas shocks at the rear it rode and handled ok, I had a Walker sports 2″ exhaust fitted with twin Lukey resonators fitted which woke it up considerably,That interior shot is exactly my old car it was a nice place to sit and could achieve 31mpg @ 110 kmh highway with the AC on full blast loaded with all my gear. Oyster was the exterior colour. 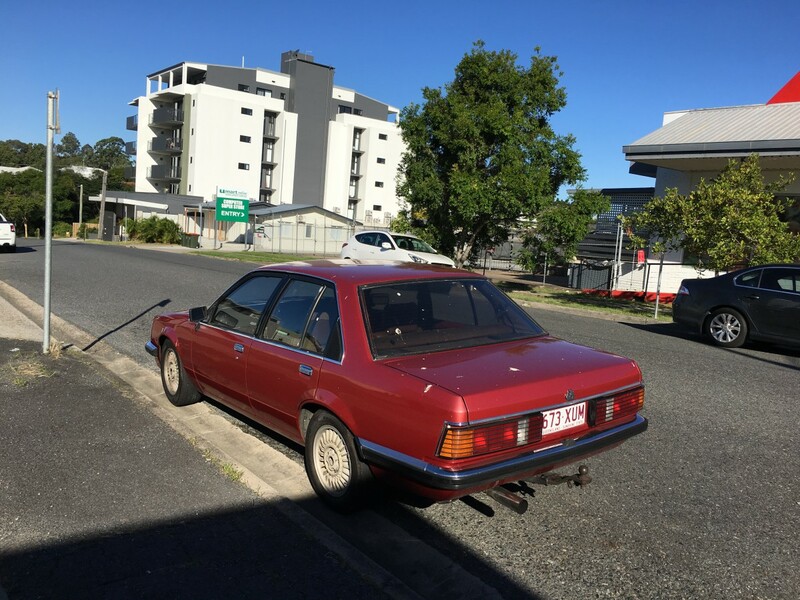 The same friend also have a VN 3.8 GTS another GMNZ oddity never built in Australia, they also came in 304 cube V8 but only here, like the fours also built until local assembly stopped in the early 90s, The GTS badge was dropped in OZ in the 70s. The Commodore was 5x120mm per Opel ever so slightly different from the 5.5″ which I think is 1.5 mm different, apparently enough to put stress on wheel studs. Have a look at the long row of blank switches in the top left of the dash of the SL/X interior (4th photo). GMH were pretty shameless about reminding you every time you got in the car that you were too stingy to dish out for the top model. Cool write-up. 15 years is definitely a good run for a family car. These are very like the Opel Rekords of the same time. These are curiously forgotten given that they sold in similar numbers to the Ford Granada. 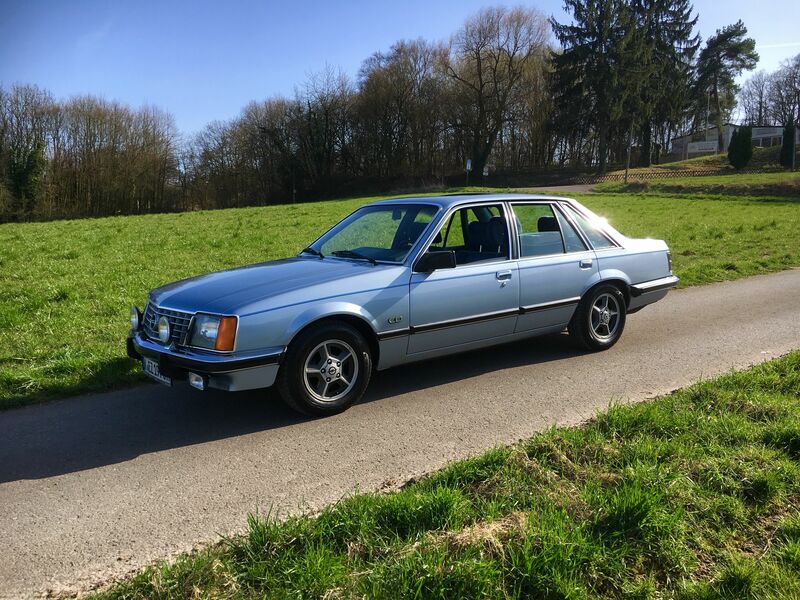 At that point in time the model sizes and prices were not as rigidly stratifed as they are now so where Ford sold one Granada in a variety of engines and trims, Opel sold the Rekord to deal with the lower end of the executive car range and they badged the 6 cylinder cars as Senators. For the UK and Ireland they sold them as Vauxhalls (Rekord and Royale). Amazingly, Opels were sold in the UK at the same time until about 1983. 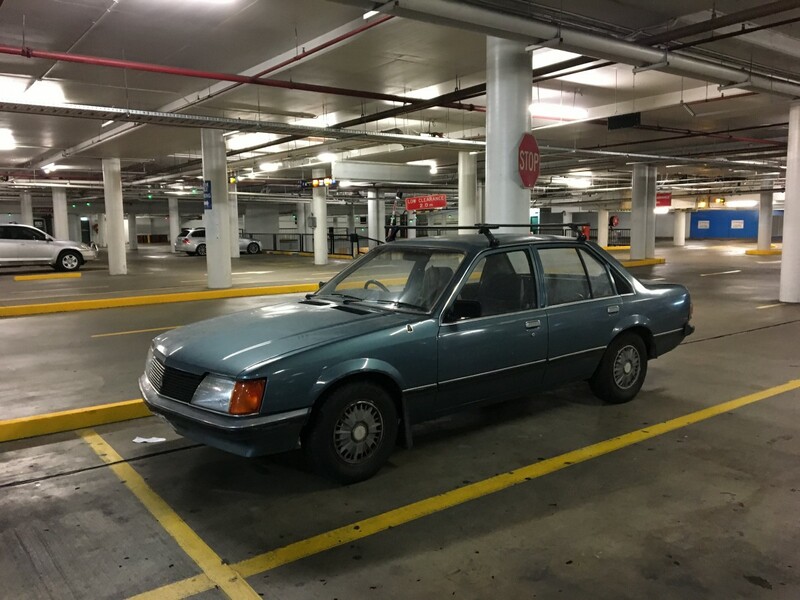 I had a look at a comparison of the Carlton and Granada written by LJK Setright in Car magazine and he quite liked the Carlton (which corresponds to the Holden Commodore). It sold quite well in the UK but since then Vauxhall has endured a worse and worse reputation. I just read an article about a new Opel show car and the below-the-line comments are incredibly hostile. Strange really for a brand whose worst crime was the all-round competent, well-priced and useful Vectra B.
I like Opel: good, honest, useful cars for real people, much like Fords yet always more sobre. I think what’s hampered Vauxhall is a period of time in the 1990s when they seemed to fall towards the bottom of the JD Power charts. I recall Opel-sourced Holdens getting dinged by mechanics here for being unreliable, at least the Vectras. The Astra became one of the best-selling small cars here for a few years and I still see plenty around. Great piece as usual Will! Happy Birthday Mrs. Stopford! It figures that in eighties Australia, a family with the name of Stopford would be Holden drivers! Your mum was amazing, William. I can’t imagine mine ever doing that. A great tribute. Happy Birthday, Mrs Stopford! My mom told me when I was growing up I had a fascination with cars at an early age. The first car I remember was a black 1947 or 1948 Buick sedanet. By the time I was four in 1957 Dad had a 1953 Buick Special. When we’d drive around I’d scream “Dere a Buick!” Or “Not a Buick!” If it was another brand. Mom said it got quite tedious after awhile. Great story, and Happy Birthday to Mrs. Stopford! I put another 400 miles on my VF-II in her honor today! I’ll bet that what seemed pretty uppity in ’82 didn’t by ’97. Your mums previous ’70’s Kingswood would not necessarily have had a rear demister, disc brakes on front, more than two fan speeds, inertia-reel belts, if manual then likely three in a horrid column shift, carpets, intermittent wipers or a column high-beam but it did have sloppy handling, heavy steering, jokey body roll, understeer and a good deal less performance than the Commodore. In ’82, a new Holden was a revelation: by ’97, of course, a base Commodore felt most unspecial. These were fundamentally good cars, pretty tough, and certainly good-looking to my eyes even now. Handling was very nice, noise levels were super-low in the early ’80’s, and praise-be, they had SEATS. Holden had never fitted seats before, just vinyl shapes maybe from the beanbag factory. Imagine, comfortable, supportive, high-set actual seats, sharp steering and a decent ride. In a Holden. Their great vice was those leaky iron 6-cylinder engines, 1963’s finest and out of date even in ’82. Adequately smooth, adequately powered at city speeds (lots of torque, low geared) but 15mpg city (perhaps 21 hwy) in an auto was really poor. Surprisingly, the body had poor aerodynamics, which you could feel (and hear) at highway speeds, particularly as the low-geared engine began to really roar against physics. Country folk could sit on 80-85mph, but the noise and fuel penalty was large. Such treatment also shortened engine life a lot. The Falcon, which had had quite some money spent on its engine and which easier pulled higher gearing, did this far better, part of the reason they came to dominate country sales despite no V8. Oddly enough, I too replaced a VH with that Astra. 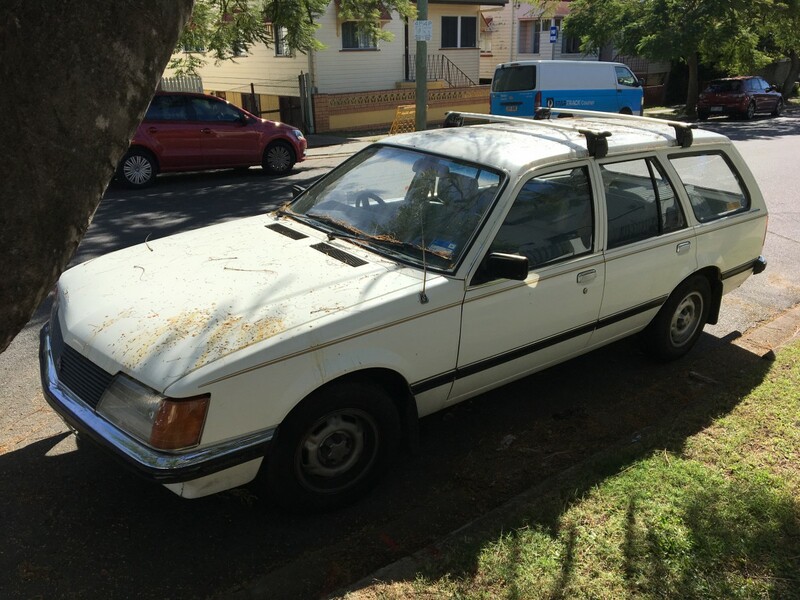 The Commode had been, true to nickname, a shitter, and the Astra a preserved peach, but the Astra never felt nearly as nice as the Commodore had been in its day. 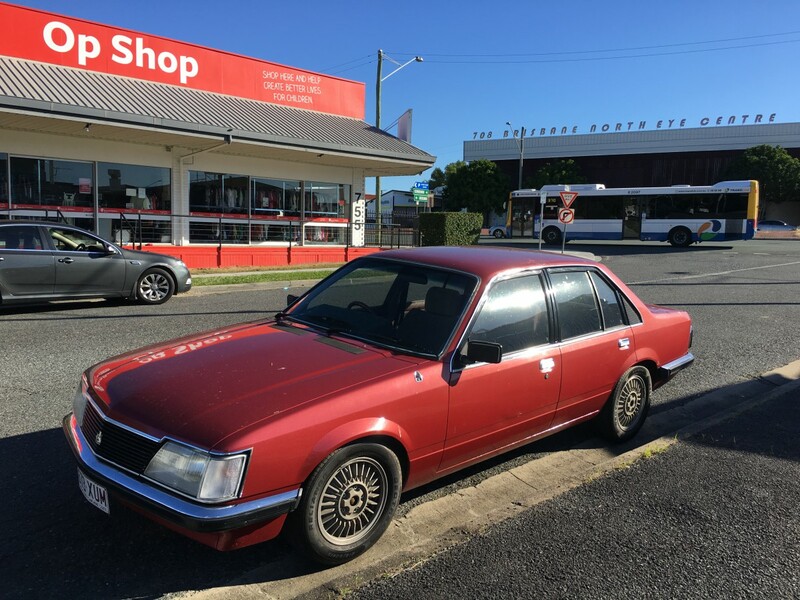 My mum had so little interest in cars she seriously thought that all Commodores were red like their VC, and proved it by twice trying to get into the wrong car after mall shopping, once succeeding. (True story – so much for Holdens boast of better security each model, she opened a red VL!) Funnily enough, her dad loved his cars, and because she went off with him to motor shows as a kid, she could still easily identify all the 1940’s cars, which even my dad couldn’t. Her automatic knowledge of those cars always made me laugh. A nice memory of her. Happy Birthday to your mum, she did well. Her son writes very nicely. Mine had the 3.08 ratio back axle and rear discs it howled some but highway gas mileage was good round town was awfull but it cruised the freeways quite nicely the sports exhaust probably helped fuel mileage, oh and when the crappy Rochester gasped its last I got a wrecking yard kit to fit a single throat Stromberg which probably helped. Yeah Security was a joke and Holden took more than a decade to address it, a screwdriver in the door lock with downward pressure popped the lock button up on mine, the ignition steering lock wasnt very robust either. I have it´s slightly bigger European brother, the Senator 3.0E CD. Those were great cars back at the time which suffered from Opel´s rather bland image. Happy Birthday Mrs. Stopford. Thank you for indulging your son, we treasure him here at CC. Thank you everyone for the kind words and the birthday wishes. I sent Mum the link to this article this morning and she enjoyed it and said she felt like she’d been around the world!